Screengrabs from Salman Khan’s first advertisement as a 15-year-old boy. Mumbai: Salman Khan’s hit film ‘Saajan’ completes 25 years on Tuesday and his looks from the film, with slightly long hair, was a hit at that time. However, we found something predating his ‘Saajan’ years, his first advertisement when he was just 15 years old and had a similar hairstyle. Dressed in a sleeveless T-shirt, Salman perhaps was a fitness freak even that time. While the lanky lad went on to become one of the biggest superstars, this ad sees him as one amongst many actors. Another known face to give him company in this ad is current sensation Tiger Shroff’s mother Ayesha, a model that time. 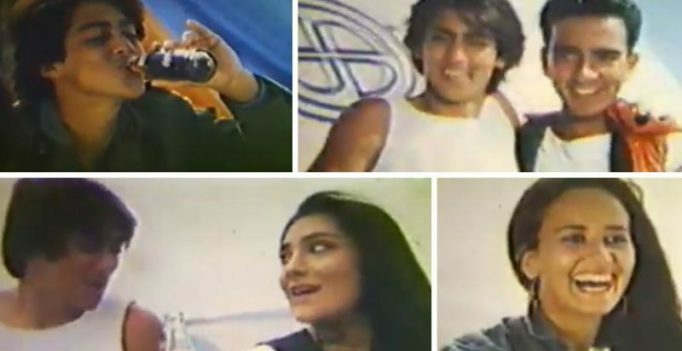 The enormity of Salman’s popularity in later years can be measured by looking at the numerous cola brands he’s endorsed in his career, while this particular cola brand vanished without a trace. Ranveer Singh to replace Abhishek Bachchan in Dhoom 4?